Everyone has hopefully recovered from the great Casino Royale night brought to you by Irish Bar and Gili Eco Trust last month. We luckily have a little update to brighten everyone’s day. The aim of the night, full of poker, roulette, black jack and many other games, was to raise money for a new engine for Gili Eco Trust’s rubbish barge. A large boat which can be pulled up on the beach of Gili Trawangan to help us rid the island and the dump of all the rubbish we have here. 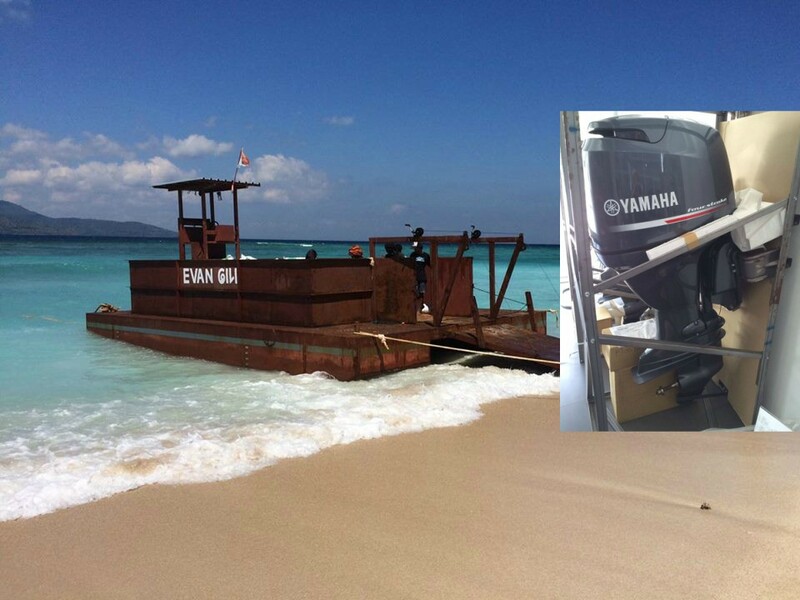 The barge has been owned by the Gili Eco Trust since February this year. With a very old 115 horse power 4 stroke engine on, the journey ferrying back from Lombok to Gili T even empty was a very slow one. So we now have enough money raised by all you lovely gamblers and avid cocktail drinkers at the Irish Bar! We are very proud to announce the purchase of a new 100 horse power 4 stroke engine to make the barges journey more efficient and more environmentally friendly. With the staggering 104 million rupiah raised by the Casino Royale night and a further 11 million raised by the CHAIRity campaign, our new engine was funded nearly entirely by the outstanding efforts in fundraising by Tir Na Nog Irish Bar. The engine and all parts to refit cost 119 million and modifications to the barge to fit the engine came to 7 million rupiah. So not far off our estimate and our earnings from these charity events. To all those that took part, dressed up, donated their money for such a good cause (and probably won some pretty decent prizes at the same time!) It all paid off as the night itself went without a hitch with many many casino goers eager to have another event like this soon! To all the wonderful businesses that never fail to donate beautiful, generous prizes that go to such a good cause! And lastly to Tir Na Nog, Irish Bar, who worked hard with us day and night to get everything ready and running smoothly on the night. The cocktails were deliciously wonderful, the atmosphere was so much fun and everyone had a great night! The CHAIRity campaign continues, as there are a lot of stools at Irish and a lot of thirsty bums that could be sitting on YOUR stool! So if you want your own personalized stool sitting in Irish Bar for long after you leave, or need a thoughtful present for a friend, then why not get yourself a hand painted memory that will stay in Irish bar forever! Each stool costs 500,000rp of which 100% goes straight to the Eco Trust’s environmental projects. Email [email protected] if you would like to get your custom bar stool designed.